Dubai: Buses will be deployed starting this Tuesday to provide a free shuttle service to airline passengers, as a number of flights will be moving their operations to Dubai World Central (DWC) during the refurbishment of the runway of Dubai’s main airport, it has been announced. The vehicles will operate between Dubai International (DXB) and DWC every 30 minutes in order to minimise the impact of the runway closure on the travelling public. The buses will depart from DXB Terminal 1, 2 and 3, the Dubai Airports confirmed on Sunday. DXB’s southern runway will be closed for 45 days, from April 16 to May 30, for a major refurbishment, leaving the emirate’s busiest hub with only one operating runway. To avoid having to cancel a lot of flights, a number of airlines will be moving their operations to DWC, which is about 60 kilometres away from the Dubai World Trade Centre. 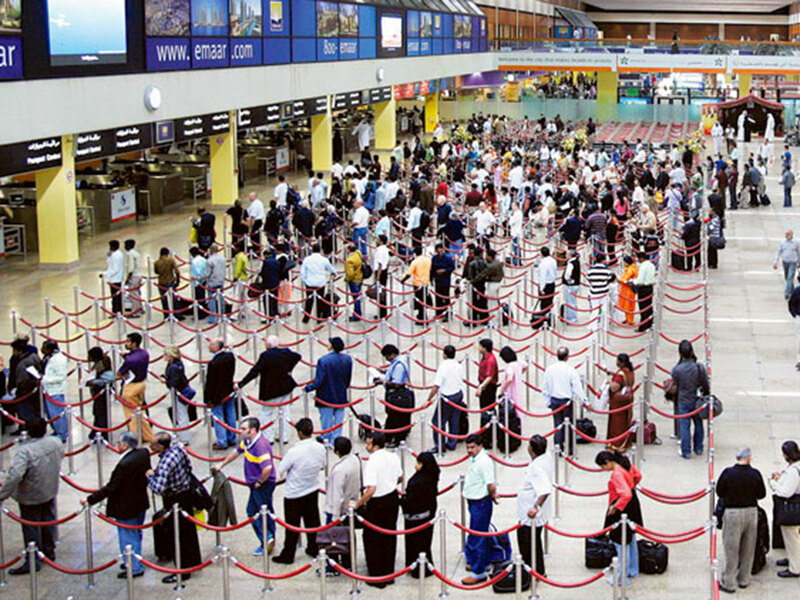 The diversion of flight operations from DXB will see the traffic at Dubai's second airport to spike by 700 per cent, but officials assured they are doing their best to minimise the impact on flyers. Dubai Airports said on Sunday that it is good to go for the runway closure, citing that with the additional capacity provided by DWC, the number of flights across the Dubai Airport system will see a reduction of only 19 per cent and a seat reduction of just 20 per cent. 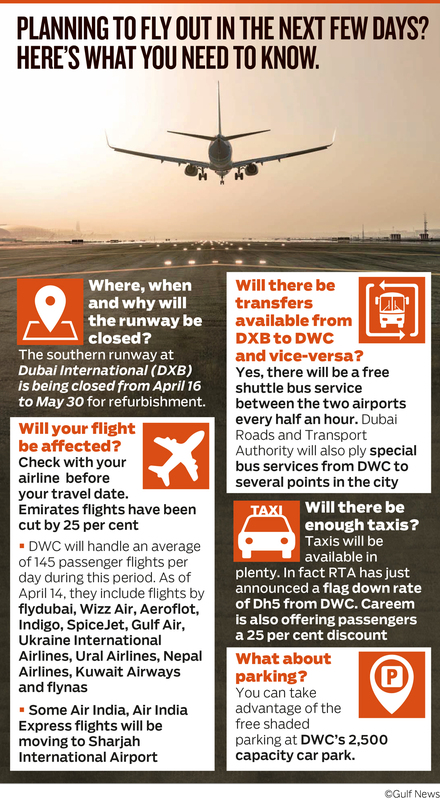 During the 45-day closure, DWC will handle an average of 145 flights per day, including those operated by flydubai, Wizz Air, Aeroflot, Indigo, SpiceJet, GulfAir, Ukraine International Airlines, Ural Airlines, Nepal Airlines, Kuwait Airways and flynas. “The main visible difference for passengers will be a potential change in airports,” Dubai Airports said in a statement. Airlines had earlier advised passengers who will be travelling during the runway repairs to arrive at the airport early and check in advance which terminal in Dubai they will be departing from or arriving into, to avoid delays. “We advise all travellers to arrive at the check-in desks two to three hours prior to their flight departure time. We encourage all passengers arriving into Dubai to check their airport of arrival and to remind anyone who’s picking them up that they might be arriving at Dubai World Central (DWC),” flydubai said. “We are encouraging passengers to confirm their airport of departure before they set out to take their flights but otherwise they can expect smooth operations and great service,” said Paul Griffiths, CEO, Dubai Airports. Passengers arriving in DWC will also get to enjoy lower taxi fares. The Dubai Taxi Corporation of Roads and Transport Authority (RTA) has announced that prices will be slashed by 75 per cent for passengers arriving at Al Maktoum International Airport (DWC), setting the flag down rate at Dh5, down from the normal rate of Dh20. In just a few days more than 600 pieces of equipment have been moved to DWC in order to handle the additional traffic and ensure a seamless and smooth operation from day one through to day 45. “We’re confident we are fully prepared and good to go for April 16,” said Paul Griffiths, CEO, Dubai Airports.